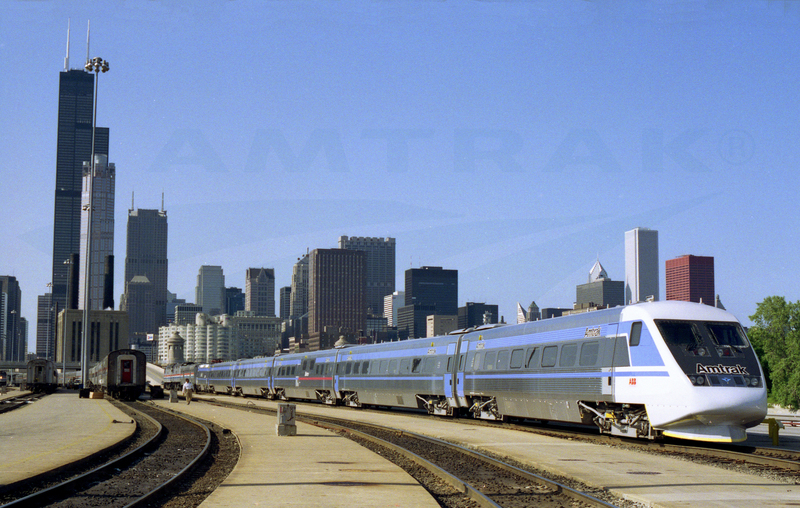 Home > Archives > X2000 in the Chicago Yards, 1993. X2000 in the Chicago Yards, 1993. Color slide showing the X2000 in the Chicago Yards for maintenance in June, 1993, during its national tour. As Amtrak explored the development of high-speed rail in the early 1990s, it leased two European high-speed trainsets for testing: the Swedish X2000 and the German Intercity Express (ICE). Both trainsets were used in revenue service on the southern portion of the Northeast Corridor in 1993. The equipment was also put on display in cities across the country. Amtrak recorded customer and employee feedback to help in developing specifications for its own high-speed equipment. Designed and built by Asea Brown Boveri, Inc. for the Swedish State Railways, the six car X2000 shown above was tested by Amtrak because it could travel at higher speeds than conventional trains on existing main line track; unlike contemporary French and Japanese high-speed trainsets, it did not require new, dedicated tracks. In a brochure distributed to passengers, Amtrak explained that the X2000 included three innovations: "AC electric propulsion, radial self-steering trucks and an active carbody tilting system." Photographer: Ingwar Afeldt. From the Ingwar Afeldt Collection.